Dendrilla membranosa may be a sponge, but it's no easy squeeze. In the frigid Southern Ocean, off the coast of Antarctica, only the strong survive. 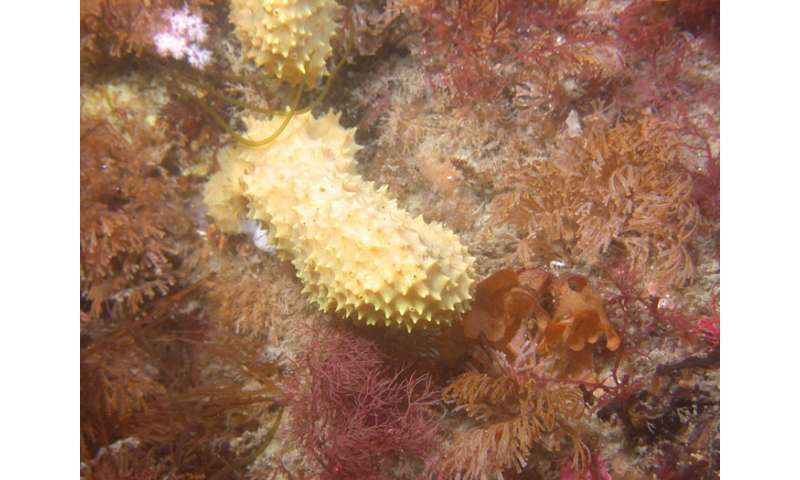 "Sponges aren't protected by shells and they can't move around," said James McClintock, Ph.D., Endowed University Professor of Polar and Marine Biology in the UAB College of Arts and Sciences Department of Biology. "When you're that leaky, you have a constant battle on your hands." The enemies are bacteria, which teem by the millions in every teaspoon of ocean water, and sea stars, whose stomachs are extruded from their mouths and laid like a balloon against sponge tissue. So, like sponges all over the world, Dendrilla membranosa fights back the only way it can, McClintock says: "by producing nasty compounds." That's why McClintock, fellow UAB biology professor Chuck Amsler, Ph.D., and Bill Baker, Ph.D., professor at the University of South Florida, have spent the past two decades investigating the defensive mechanisms of marine algae, sponges and other invertebrate species that make their home in Antarctic waters. The subject is of great scientific value in its own right, but these defensive chemicals also hold promise for humans, too. Over the years, the team has solved the chemical structures of some 24 compounds, and tested about 1,000 extracts of organics, McClintock said. That work has identified two promising natural compounds that are being studied as potential drugs: a protein found in an Antarctic red alga that is active against the H1N1 flu virus, and a smaller compound the research team named palmerolide in honor of Palmer Station that has potent activity against melanoma skin cancer. 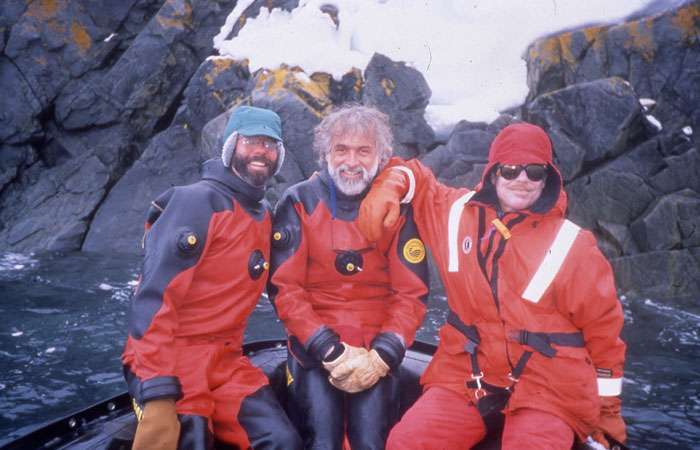 From left: Charles Amsler, Bill Baker and Jim McClintock have been exploring Antarctic waters for more than two decades as principal investigators of National Science Foundation grants. Image courtesy of Jim McClintock. In May, the researchers reported a third such discovery in the journal Organic Letters: a compound isolated from Dendrilla membranosa that is remarkably effective against methicillin-resistant Staphylococcus aureus, or MRSA. According to the Centers for Disease Control and Prevention, more than 80,000 invasive MRSA infections are diagnosed in the United States each year, and more than 11,000 patients die from MRSA-related complications. In lab tests, the compound, which the researchers named "darwinolide" after the sponge's family name, Darwinellidae, killed 98 percent of MRSA cells. "It"s a defensive compound against microbes," McClintock said, "with some very interesting properties." Staph infections are common and reasonably easy to control, but when they are caused by bacteria resistant to antibiotics, doctors have limited treatment options. One protective mechanism deployed by bacteria, including MRSA, is the "biofilm"—a coating of carbohydrates, proteins and DNA that is essentially impenetrable to virtually all drugs currently on the market. But darwinolide can get through the biofilm to destroy the bacteria, the researchers found. "When we take antibiotics, they're chasing bacteria in fluids" where they are relatively defenseless, McClintock said. But when it comes to biofilms, "there hasn't been anything that's active against them," he continued. "If you have a knee replacement and MRSA gets in there, for example, they can't treat it. They just have to take it out and start over. That's why it was a big surprise to find that darwinolide has this activity against biofilm." 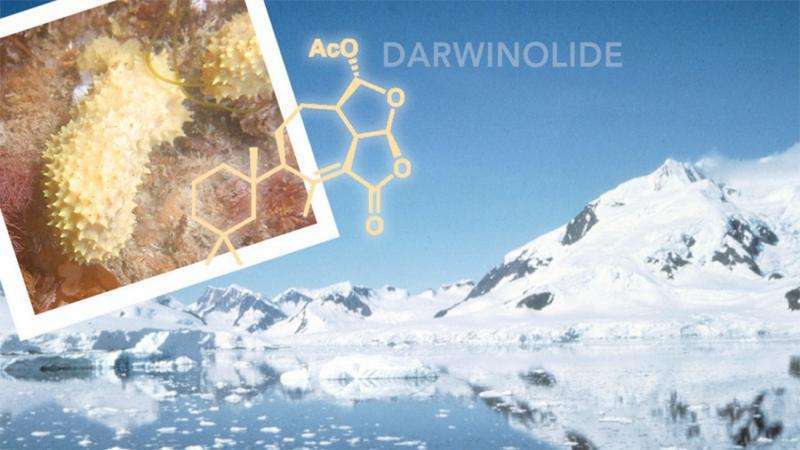 "Darwinolide differs from previous, somewhat similar, drug candidates from sponges because its central ring structure is rearranged in an unusual way," Amsler added. "If that rearrangement of the chemical backbone is in part responsible for the effectiveness against biofilm bacteria, it might be able to serve as a chemical scaffold for the development of other kinds of drugs targeting pathogens within biofilms." Dendrilla membranosa defends itself against bacteria and sea stars with toxic compounds that are also effective against the land-based scourge MRSA. Credit: Bill Baker. The next step, McClintock says, is to synthesize darwinolide in the lab. "You can't take big barges down to Antarctica, harvest a bunch of sponges, and send them back to the United States," he said. "The good news is that 99 percent of natural products can be synthesized in the lab." After that, the researchers need to map out the compound's mode of action—how exactly it breaks through the biofilm to kill MRSA. If this work produces a clinic-ready treatment, it could save the lives of tens of thousands of patients worldwide. A treatment could also bring economic benefits to UAB, and the people of the state of Alabama, McClintock explains. UAB and the University of South Florida are co-patent holders, "so if a drug is developed, UAB would stand to receive something on the order of 20 percent of the royalties," he said.